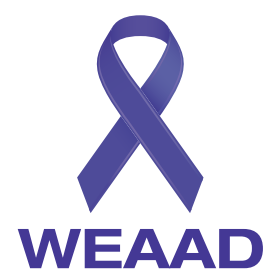 At the 89th Plenary Meeting of the United Nations General Assembly in December of 2011, Resolution 66/127 designated June 15th as World Elder Abuse Awareness Day (WEAAD). This day has been set aside for all nations of the world to take a unified stance against the abuse and neglect suffered by senior citizens. Employment and Social Development Canada defines elder abuse as any action by a person in a trusted relationship that causes distress or harm to an older person. Most common forms of elder abuse are psychological, physical, and financial, which may take the form of an isolated incident, or an established pattern of behaviour. 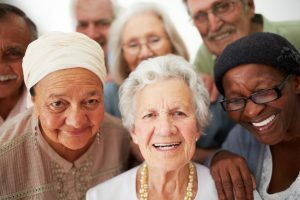 According to the World Health Organization (WHO), the global population of those 60 years or older is expected to more than double from 542 million in 1995 to an estimated 1.2 billion by 2025. With populations aging quickly, cases of elder abuse are expected to increase. 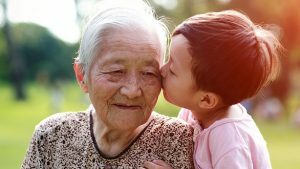 In many parts of the world elder abuse is not noticed or acknowledged as a growing social issue, but instead is considered to be a private matter to be handled quietly. Even in today’s world of heightened social consciousness, elder abuse is still viewed as a taboo subject, often ignored in the community. Evidence is growing to indicate that elder abuse is a public health and community concern. The British Columbia Association of Community Response Networks (BCCRN) recently reached out to us to design and produce a special flag to spotlight World Elder Abuse Awareness Day. It all began when a community coordinator requested a flag to be flown at City Hall. 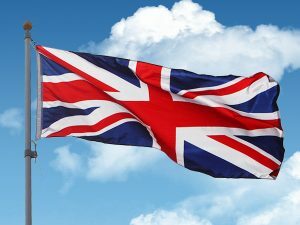 With 40 flags in their first order, we just learned that one flag has already made its way to the United Kingdom! The Flag Shop thanks the Canadian Network for the Prevention of Elder Abuse for the work they do to stop elder abuse, and for helping to share the flag with others! The BCCRN grew out of the need to create an on-going, permanent provincial funding and support structure for the benefit of adults facing abuse, neglect, and self-neglect. The association provides project funding, materials, training, support people, and maintains a website to assist its Community Response Networks (CRN). At the local level, CRNs facilitate abuse and neglect prevention and education with stakeholders to end adult abuse in British Columbia. 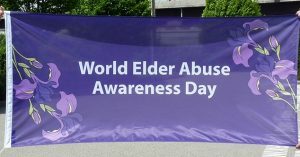 If you’d like to be counted among the many around the globe who will take a stand against elder abuse, remember to wear purple on June 15th, the colour which is known to symbolize elder abuse awareness, and fly the WEAAD flag. We are thrilled to be the supplier of this flag, so get yours today! For more information and resources about elder abuse awareness, including a Seniors Guidebook to Safety and Security, please visit the RCMP Elder Abuse website. 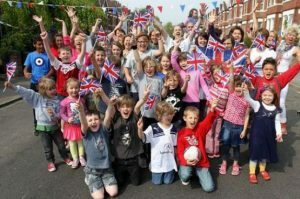 If you enjoyed this blog, and would like to read more interesting stories about flags, and events taking place in your community, subscribe to our blog in the upper right corner of our blog page at: blog.flagshop.com. It’s quick and hassle-free! And, don’t worry, if you’re not captivated by every word, unsubscribing is just as easy! Queen Victoria was born nearly 200 years ago, and all these years later, we’re still celebrating her birthday! In fact, Canadians have been celebrating Victoria Day since 1845, when the first legislation was passed by the Parliament of the Province of Canada, to set aside May 24 as a day to officially recognize the Queen’s birthday. Queen Victoria was born in 1819 and died in 1901. 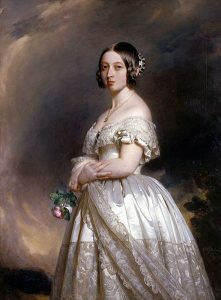 Victoria was the reigning Queen of England when Canada joined Confederation in 1867. Queen Victoria ascended to the throne in 1837, at the age of 18, following the death of her uncle, King William IV. Victoria married Prince Albert of Saxe-Coburg and Gotha, and as Queen she was required to propose to him! It’s Party Time – Find a Celebration Near You! 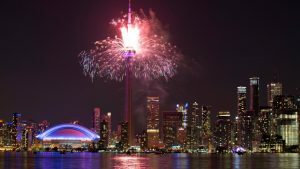 Canadians across the country celebrate Victoria Day with parades, fireworks, and special events. There are so many fun activities planned, we can’t possibly list them all. Here’s a small sampling of what’s happening in communities across Canada! 11:00 a.m. to 4:30 p.m.
National Patriots Day or Journée nationale des patriotes is celebrated in Quebec on the same day as Victoria Day. It was established by the Lieutenant Governor of Quebec-in-Council in 2003. 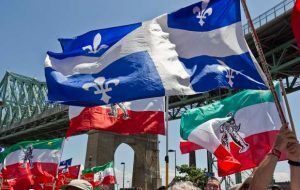 The day honours the struggle for national recognition of the people of Quebec, as endured by the patriots of 1837-1838. While you’re out celebrating Victoria Day, look for the Royal Union Flag, more commonly know as the Union Jack. 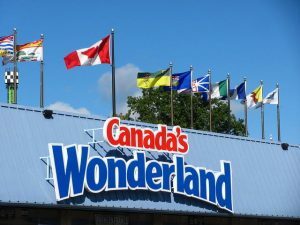 On Victoria Day, according to Canadian government protocol, this flag is to be flown at all federal government buildings, including crown corporations, military bases, and airports. The Union Jack was first proclaimed by James I in 1606, when he ascended to the thrones of both England and Scotland. He knew the importance of creating a flag reflecting the crosses of each nation. Then, in 1801, when Ireland joined the United Kingdom, the Cross of St Patrick was added. Take a closer look at the full range of Union Jack products available at The Flag Shop. So, what does Victoria Day mean to you? If you’re like the rest of us, aside from its rich and interesting history, there’s no denying that Victoria Day also unofficially signals the beginning of summer fun! 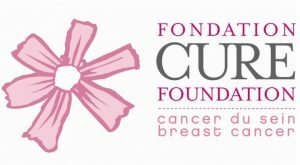 The Flag Shop Jumps on Board with the CURE Foundation’s National Denim Day! Comments Off on The Flag Shop Jumps on Board with the CURE Foundation’s National Denim Day! 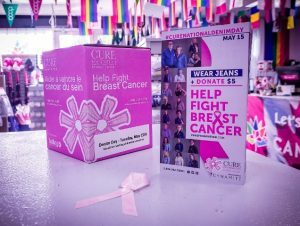 Yesterday, May 15th, was the CURE Foundation’s National Denim Day, and the team at The Flag Shop Vancouver jumped on board to join the fight against cancer. Many wore denim to work, as well as the signature pink ribbon, making personal donations in support of breast cancer research and prevention. National Denim Day creates awareness and provides resources for the foundation to explore all possible avenues in the battle against cancer, so that no lives are lost due to a lack of funding. The team was treated to a special lunch by The Flag Shop President, Susan Braverman, to encourage a day of giving, team unity, and fun. She said, “We all have a cancer story and we’ve all been touched by cancer, in some way. National Denim Day gave us a chance to do something as a team to join the fight!” She added, “On top of encouraging my staff to donate what they could, the company matched the team contribution!” The Flag Shop Vancouver raised $377.10 for the CURE Foundation’s National Denim Day campaign. The first-ever National Denim Day took place 22 years ago in 1996, and continues each year on the first Tuesday after Mother’s Day. This campaign unifies more than 400,000 Canadians, of all ages, from all walks of life, who share a common understanding that together, we have the power to bring hope and change to those affected by breast cancer. 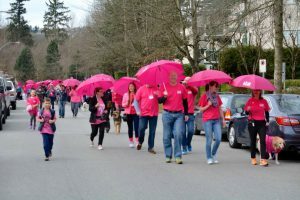 According to Canadian Cancer Society statistics, in 2013 an estimated 23,800 new cases of breast cancer were diagnosed in women, with 200 cases in men. In 2013, 5,000 lost their lives to breast cancer. Cancer, in all its many forms, is the leading cause of death in Canada. According to Statistics Canada, in 2015 77,054 Canadians lost their lives to cancer (29.2% of all deaths that year), followed by heart disease (19.5%), and stroke (5.2%). These statistics reflect the harsh reality of cancer, and point to the critical role of awareness and prevention in keeping all Canadians healthy. Whether it’s about prevention, regular screenings, or treatment, the work of the CURE Foundation and other not-for-profit cancer agencies positively impacts the lives of those who have been affected by cancer. 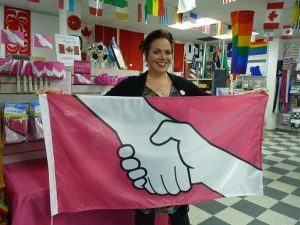 For more than 40 years, The Flag Shop has been proudly supporting not-for-profit cancer awareness, research, and prevention organizations, such as the CURE Foundation, the Canadian Breast Cancer Foundation, the CIBC Run for the Cure, the Canadian Cancer Society, and the BC Cancer Agency, and many others, sharing a long and rewarding history. We know our street banners, that’s for sure! And, it’s our privilege to support organizations whose daily work is focused on fighting cancer and other serious illnesses. At The Flag Shop, our banners are manufactured in our production facility on Powell Street, in Vancouver. Our goal is to make things easy and hassle-free, so we also install, remove, wash and store the banners for future use. 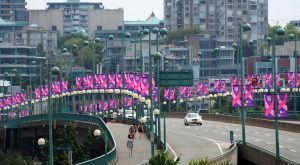 This not only saves money, but it’s socially responsible because it means the banners can be re-used, reducing waste, and keeping them out of landfills sites. Thank you to Social Crust Cafe & Catering for yesterday’s delicious lunch! Social Crust is a social enterprise launched by Coast Mental Health. Employees are graduates of the Coast Mental Health’s Culinary Training Program, which creates training and employment opportunities for at-risk young adults facing employment obstacles. If you enjoyed this blog, and would like to read more interesting stories about events taking place in your community, subscribe to our blog in the upper right corner of our blog page at: blog.flagshop.com. It’s quick and easy! And, don’t worry, if you’re not captivated by every word, unsubscribing is easy, too! I’ve never cared much for “Hallmark Holidays”, but when it comes to the lifetime I’ve spent celebrating my mom on Mother’s Day, I definitely make an exception! 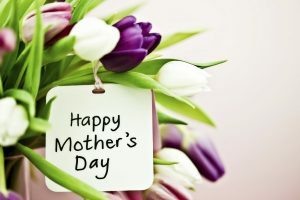 Being a former elementary school teacher, I know first-hand that starting from when our children are in school, teachers often help them prepare gifts and cards in advance of Mother’s Day, so moms everywhere can receive something special on the second Sunday of May. I also know that for some these hand-crafted gifts are so precious that they’re often kept as mementos of years gone by. 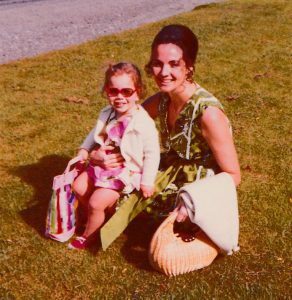 Mother’s Day: How Did It Start, Anyway? Some of the earliest-known celebrations of mothers date way back to ancient Greek civilization, honouring Rhea, the mother of the Gods. 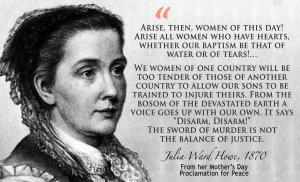 Later on, in 1870, Julia Ward Howe of Massachusetts wrote “The Mother’s Day Proclamation” calling for woman to unite for peace. Then in 1908, Anna Jarvis of West Virginia held a private memorial celebration in remembrance of her mother. The following year, she planned a church service, celebrating mothers, which was attended by more than 400 children and their mothers. In 1914, Mother’s Day became an official holiday in the US, and today, it is celebrated all over the world. In Germany, Mother’s Day was declared an official holiday in 1933. Early traditions included gifting mothers with medals of gold, silver and bronze, for bearing children. 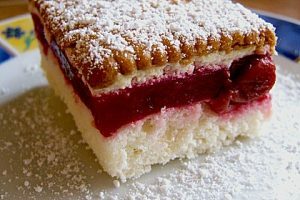 Today, people gather to treat their mothers to a special meal, which typically ends with a special dessert called Rote Grüetze. In Ethiopia, they take Mother’s Day celebrations very seriously, so much so that they hold feasts called “Antrosht”, which last for three whole days. Children gather the ingredients for preparing traditional hash. Girls are responsible for the vegetables, spices and dairy, such as cheese and butter, while boys bring the lamb or bull. Unlike in the western world, where moms usually take a break from cooking, mothers in Ethiopia prepare the meals for the feasts. 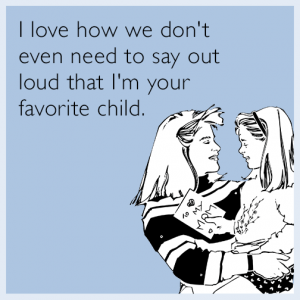 In Japanese, “Haha-no-hi” means Happy Mother’s Day, and sons and daughters greet their mothers with this expression. Most commonly, mothers are given carnations, symbolizing the sweetness and purity of a mother’s love. And, did you know? “Mama” is one of the most universal words, appearing in the 10 most commonly spoken languages of the world, reflected as: māma, mama, mamá, ma, mama, mamã, maa, mama, haha and mamī. Another cool fact: 3.4 billion people of the world speak Mandarin (Mãma), Hindi (māṃ), English (mama), or Arabic (māma). My mom, Doreen Braverman, founded The Flag Shop in 1975, when I was a seven year-old girl. When I think about those early days, I can truthfully say that I spent more time in the shop than I did at home! Flash forward 35 years to 2010, when I purchased the company and became President. I still remember bringing my baby to the office, just days after she was born, so I can hardly believe that today, my daughter Alex is 25 years old! This tradition of mothers and daughters at The Flag Shop is all thanks to my amazing mom, who has given of herself so much. I just can’t do enough to express my gratitude and love! Without question, if it were not for my mom, I wouldn’t be writing this blog, and I definitely wouldn’t be where I am today! According to the most recent data from Statistics Canada, in 2011 there were 9.8 million mothers in Canada, which includes biological, adoptive, and stepmoms. That adds up to millions of flowers and cards given and received. For a Mother’s Day snapshot, representing only one of Canada’s 13 provinces and territories, SaskTel predicts some astonishing figures. In the province of Saskatchewan (home of The Flag Shop Saskatoon), call volumes are expected to reach 1,060,000 and text messages are predicted to reach 10.2 million, for well-wishers, this coming Sunday. As our mothers taught us long ago, tuck in your shirt, get a hair cut, use your manners, and don’t forget to call your mom! As I reach a personal milestone celebrating my 50th birthday today, it’s a natural time of reflection, recalling some of the defining moments of my past. At the same time, I’m looking towards the future with excitement and enthusiasm for all that is yet to come! Tomorrow, May 4th, is the United Nations Anti-Bullying Day, and I can’t help but to remember my experiences as a youth in grade 8, having to change schools to escape the torment of my bully. Though many years have passed, it doesn’t make the emotional trauma of those days any less real. I’m just so thankful that I had the support of family to help me through those difficult times. I’m so glad they knew to reassure me it was not my fault, that they knew to talk about it with school leaders, and that they gave me real steps to take to address the bullying behaviour. Sadly, bullying continues to impact many school-aged children and youth today. According to the Canadian Institutes of Health Research (CIHR), Canada has the 9th highest rate of bullying among 13-year-olds across 35 countries. 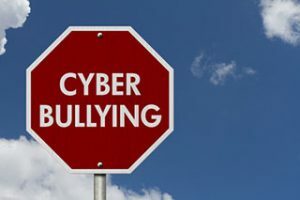 CIHR findings indicate that exposure to bullying increases risk of suicidal thoughts, and that 73% of victims reported experiencing cyber-bullying. With today’s technology, kids are faced with the harsh reality of cyber-bullying, which is much more difficult to escape compared to the bullying of my youth. With cyber-bullying, a child or youth is targeted, using cell phones and other devices, to harass, embarrass, threaten or humiliate. In many cases, this “drama”, hating, or gossip can be relentless, spreading quickly, and causing severe damage to self-esteem and mental health. On May 4th, it’s a time to talk about, and take a stand against bullying. Other special days set aside to create focus around bullying include: Pink Shirt Day, Day of Pink, and Blue Shirt Day. My team and I are deeply honoured to support this cause, doing all that we can by providing schools and other organizations with anti-bullying flags, and promotional items such as pins, crests, and lanyards, to help fight the good fight! We are proud of our school fundraising program, enabling schools to increase awareness, and think about the serious impacts of bullying, while raising funds for school programming. We first met Grace Fenton in 2014, when she was a grade 7 student from Albert Mines, New Brunswick. Grace created an anti-bullying design for a Pink Shirt Day contest at her school. When The Flag Shop learned about it, we recognized an amazing opportunity to support anti-bullying efforts, while honouring Grace’s achievement. Her original design holds a positive message, representing the importance of helping those who may be experiencing bullying. 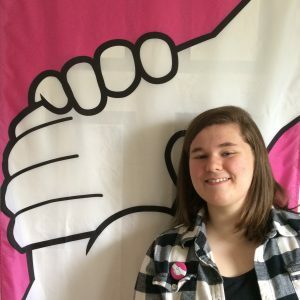 Grace’s flag was hoisted for the first time in 2014, and later that year The Flag Shop was given exclusive rights to use her design, supporting anti-bullying efforts across Canada. 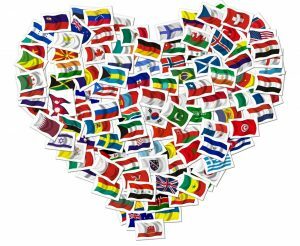 We love the design and its message so much that we didn’t stop at flags, so take a look at our full product line! Grace Fenton, thank you for the inspiration! If you’re wondering what you can do to put a stop to bullying and help to create a world in which our children’s children can live peacefully, join us as we continue to educate ourselves about bullying and prevention, and commit to taking action at the first hints of bullying. Make EVERY day Anti-Bullying Day! 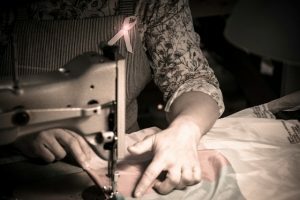 You are currently browsing the The Flag Shop Blog blog archives for May, 2018.